The trend is changing. Amidst the horde of foreign recruits, an Indian has made it a habit of scoring crucial goals in crunch situations. It’s now a regular feature whenever Churchill Bothers play. Put your hands together to applaud the Singh from Hoshiarpur. Balwant Singh is the ‘King’ for the Goan outfit at the moment. He opened the scoring for Churchill Brothers to set the tone in the Final of the 35th Federation Cup against Sporting Clube de Goa at the Jawaharlal Nehru Stadium in Cochin on Saturday (January 25). Churchill sustained the momentum and wrapped it up in style. 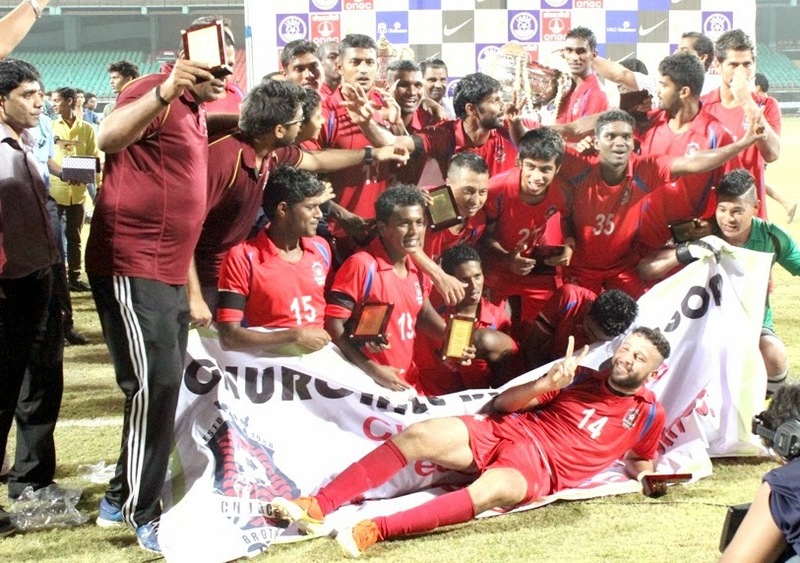 Riding on goals from Balwant, Alesh Sawant and Abdel Hamid Shabana, Churchill Brothers romped home convincingly as they beat Sporting Clube 3-1 in an one-sided Final to lift their maiden Federation Cup title. For Sporting Clube, Victorino Fernandes reduced the margin. Looking back, one also needs to applaud Churchill’s team-effort. The discipline, both on and off the field was visible right from day one. Coach Mariano Dias planned differently keeping in mind his rival Team as Churchill went better with every match. Deserving Winners, no doubt! With both Teams preferring to play safe, Balwant felt it best to break the deadlock in the 21st minute. Collecting a ball from Denzil Franco, Balwant with his deft feint sidestepped Joyner Lourenco, went past Sporting Goalkeeper Ravi Kumar and placed it into the net. The Churchill trademark, of taking the lead in all the Matches, continued. The crowd preferred to backtrack and find out – this was Balwant’s fourth goal in the Tournament. Churchill’s second goal came immediately after resumption, An unmarked Sawant had all the time in World to tap in Wolfe’s centre after the Sporting defence failed to react and clear it in time. More was in store. Shabana, who till then, was playing the perfect foil to Lenny Rodrigues, made it 3-0 in the 65th minute. The former collected a Thangjam Singh through pass and placed it past Sporting Goalkeeper Ravi Kumar. Victorino Fernandes did pull one back for Sporting in the 67th minute when he tapped in Kalu’s through pass before Churchill Goalkeeper Lalit Thapa could intercept it. But it didn’t change the fortune of the match. Earlier, no Team was willing to the risk early and preferred to play it safe. Though the ball travelled from one box to the other, none were able to penetrate. It was not till the 16th minute before any attack looked threatening until Churchill Brothers’ Anthony Wolfe sped down the left flank to sneak into the rival box only to be thwarted by a composed Gonzalo Neila. Sporting on the other hand, preferred to attack down the right, Bevan d’Mello trying to unsettle their Goan neighbours with his speed. But the Churchill defence wasn’t porous. Post Balwant’s goal, it could have been disastrous for Sporting had not an alert Ravi Kumar cleared the danger after Neila had failed to intercept a long ball. Add to that, Wolfe losing his balance, Sporting were lucky indeed. Churchill, by then, had taken over the reins of the match. Shabana, in an effort to blast it in, hit the post. He collected the ‘second-ball’ following a Thangnam corner-kick and even as Ravi Kumar flung himself full, it beat his hands and bounced back off the post as Churchill held onto their one-goal lead at the interval. In the second half, Churchill Goalkeeper Lalit Thapa’s reflexes came to his Team’s rescue when he saved a blinder – a Ogba Kalu placement from inside the 6-yard box. It happened in the 48th minute. Churchill could have added added more to their tally but it wasn’t destined. First, Joyner cleared Shabana’s placement as it was addressed to the net and then, in the next minute (85th), Wolfe failed to address it into an open net. The Champions went back richer by Rs. 25 lakh while the Runners-up collected Rs. 15 lakh. FREE HEALTH CHECK-UP CAMP ON 7th Dec.